The Marrucini were a group of Italics who, during the Iron Age, were located in the eastern centre of the peninsula, between the central Apennines and the Adriatic coast. The were neighboured to the north by the Picentes and Vestini, by the Frentani to the south, and by the Samnites and Paeligni to the west. The Oscan-Umbrian group of which the Marrucini were part are largely accepted as being Indo-Europeans (perhaps proto-Celts) who migrated into the peninsula from the north. 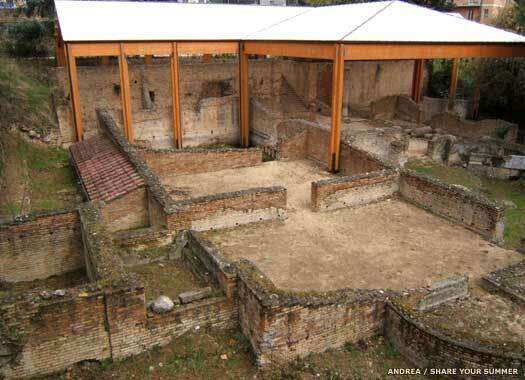 They settled in communities that were centred on Teate (modern Chieti), with secondary settlements at Aternum (Pescara, shared with the Vestini), Ceio (modern San Valentino), Civitas Danzica (modern Rapino), and Iterpromium (the ruins survive underneath Casauria's Abbey of San Clemente). Strabo and Pliny, along with other ancient writers, state that the Picentes and Samnites were originally tribes of the Sabellians. This was a collective of central Italian tribes during the Iron Age, comprising the Marrucini, Marsi, Sabini, and Vestini. More specifically, the Picentes and Samnites may have been a division of the Sabini, who were themselves descended from the Opici. Writers frequently link one to the other, sometimes referring to the Samnites as Sabellus, seemingly as an umbrella term for their origin. 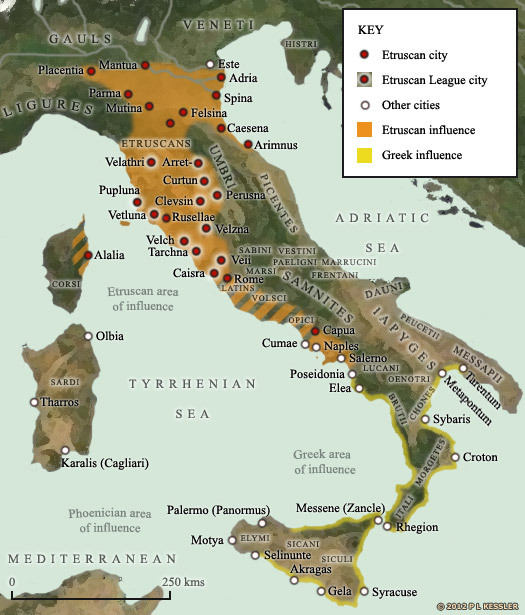 From the Samnites were descended the Lucani, and from the Lucani the Brutii, while from the Opici were descended a great number of the central Italian peoples. Their language came from the Oscan-Umbrian group of Indo-European languages (P-Italic), which were widely spoken in Iron Age central and southern Italy before the rise to dominance of Latin (Latin itself was a slightly more distantly related language, coming from the Indo-European Latino-Faliscan group, or Q-Italic). An example of the Marrucini dialect was the 'Bronze of Rapino' which is dated to about 250 BC. This is interesting because it also shows a name form that indicates a pre-Italic influence - perhaps from a tribe that might have been conquered by the Marrucini. The bronze survives today in a Russian museum. The region of central eastern Italy is first settled, by an Italic people who become known as the Picentes. Strabo claims that they are part of a group known as the Sabellians (along with the later Marrucini, Marsi, Sabini, Samnites, and Vestini). They possibly eject mixed settlements of Siculi and Liburni to take the land, pushing the former inhabitants southwards. Probably by this period the Frentani have occupied the territory in the modern region of Molise, on the Adriatic coast, immediately north of the Gargano promontory. Their migration there seems to detach them from the main Samnite body, and gives them a border close to the River Aternus, which places them on the southern flank of the later Marrucini (probably still part of the Sabellian collective at this time). By this stage, the Samnites are undoubted masters of the central southern Apennines, probably having evicted or absorbed any remaining Opici and pushing their remnants towards the Tyrrhenian coast of Italy. The Opici appear to quickly disintegrate as a recognisable group, although they survive for a few more centuries as a weak and unimportant people located between Rome and the Samnites. Their disintegration appears to have been speeded up by their fragmentation into various smaller groups which include the Aequi, Brutii, Hernici, Lucani, Marrucini, Marsi, Picentes, Sabini, Samnites, Vestini, and Volsci. This process occurs between the tenth and sixth centuries, and it leaves the core group of Opici with little remaining substance. The Marsi ally themselves with the Romans as a means of removing Samnite mastery over them, while the Dauni, Iapyges, Lucani, Messapii, and Peucetii side with the Samnites at the start of the Second Samnite War. It is in this period that the Marrucini are first documented historically, when they are recorded as being confederates of the Marsi, Paeligni and Vestini tribes. The Samnites are defeated by Rome, ending the Second Samnite War. Their confederates, the Frentani, Marrucini, Marsi, and Paeligni, voluntarily accept their reintegration into Roman administrative rule. All the other Samnite allies are also subjugated by Rome. Along with the Etruscans, Lucani, Marsi, Paeligni, Picentes, Samnites, and Vestini, the Marrucini fight the Social War (Italian War, or Marsic War) against Rome. The war is the result of increasing inequality in Roman land ownership, and the spark for conflict is delivered by the assassination of the reforming Marcus Livius Drusus, whose efforts would have led to citizenship for all of Rome's allies. Marrucini leader during the Social War. Killed in action. Although defeated, the Italic tribes are granted the Roman citizenship which had previously been withheld from them. Little is known about the Marrucini in general, and after the war they appear to quickly fade away, being absorbed into the dominant Latin culture of Rome.